Non-fiction – Kindle edition; Allen & Unwin; 320 pages; 2014. You may have heard of Dr Munjed Al Muderis — he’s an orthopaedic surgeon who has pioneered techniques for treating soldiers who have lost limbs. But he wasn’t always so well-known or successful. He was once a refugee. Walking Free is the book he penned a couple of years ago with the help of journalist Patrick Weaver. It’s the kind of book I’d love to shove into the hands of every politician, policymaker and racist in the West. Not only does it tell the extraordinary tale of one man’s bid for freedom, it’s an illuminating, often anger-inducing, look at the way we treat refugees. And, if nothing else, it highlights that refugees are human beings — with life experiences, knowledge and skills to benefit us all. Muderis was born into a rather privileged family in Iraq — he is descended from the Prophet Mohammed and one of the nine families that originally ruled Baghdad — in 1972. When he was a school boy, Saddam Hussein came to power. There were wars with Iran and Kuwait, the latter interrupting his plan to study medicine in New York. Instead he applied, and was accepted, to study medicine in Basra. Marriage and a child followed shortly after. Then I was accepted into the surgical training program. It was a dream come true. I’d wanted to be a surgeon—especially an orthopaedic surgeon—since I was twelve or thirteen and saw the first Terminator movie. The idea of half man, half machine really captured my imagination and made me think that in future surgeons would be able to replace damaged or amputated limbs with mechanical devices. My enthusiasm to become a surgeon was boundless, but resources were hard to come by. For urgent use, we were reduced to keeping drip lines, saline solution and such things in our lockers in the on-call room, because the supplies just weren’t available. Things took a turn for the worse when Muderis, now 27, was working as a junior surgeon in the Saddam Hussein Medical Centre in Baghdad. It was 1999. A busload of army deserters were hauled into the hospital and Muderis and his surgical colleagues were ordered to cut off the tops of their ears. The order came direct from Saddam Hussein. When one surgeon objected on the grounds of the Hippocratic oath of “do no harm” he was taken outside and summarily executed by gunfire. Muderis, aware that the same would happen to him, did the only thing he could think of: he hid in the women’s toilet for five hours and then fled when the coast was clear. He knew he was now a marked man, and for the next few weeks lived a life on the run, eventually getting across the border to the relative safety of Jordan with the help of family and friends. He then flew to Malaysia, the only place in the world where Iraqi citizens did not need a visa, and unwittingly fell in with a pair of refugees who were aiming to get to Australia with the help of some human traffickers. Holed up in Indonesia, he expected to wait months to get himself on an illegal boat to Christmas Island, an Australian territory south of Indonesia, but he was able to jump the people smuggling queue because a doctor was needed on board the next “ferry” out. What ensued was a frightening drama at sea — more than 160 people crammed on a boat designed for 50, with basic food, scarce medical supplies and scarce water. I knew we were all in for a horror of a journey. You didn’t need to be a medical expert to figure out this was a recipe for disaster. […] We had heard on the news when we were in Jakarta about a refugee boat that had left a few days before ours and had sunk. No survivors. So our tenuous grip on life was extremely high in our consciousness. Later, we were given photo identity badges with our allocated number. It was, as many things were in Curtin, completely dehumanising. And, I feel certain, it was purposely so. Our initial contact with the Curtin officers was equally as confronting and depressing. ‘Go home,’ they were telling us. ‘If you think Australia’s a land of milk and honey, think again.’ And: ‘Be careful, there are deadly spiders and snakes all over the camp and if they bite you, they can kill you in a few minutes. There’s nothing you’ll be able to do.’ Welcome to Australia. To cut a long story short, Muderis was eventually given refugee status and allowed to stay in Australia — but it was a long 10 months to get there, having been punished with solitary confinement on several occasions and being sent to an actual prison (where the conditions were so much better than the camp) for a short stint. And despite this inhumane treatment — Muderis calls his experience at Curtin as “the ultimate dehumanisation” — he decided to adopt Australia as his homeland and get on with the business of leading a full and productive life. He is now one of the world’s leading specialists in osseointegration in which prosthetic limbs are implanted and fused into bone Terminator style. Ironically, much of his work helps soldiers who lost limbs in the Iraqi war. There’s no doubt Walking Free is a compelling and powerful true story. 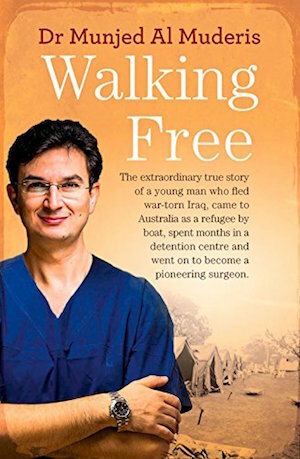 Indeed, it is almost too outrageous to be true — to go from refugee to world-leading orthopaedic surgeon seems like something only a Hollywood scriptwriter could come up with. And yet the tale that is told here, linear fashion and occasionally clunky (it takes a while to get going), is entirely factual. I went through a whole gamut of emotions reading it — from shame to anger and everything in between — but came away feeling buoyed up by hope. Yet I can’t help thinking that Muderis survived because he was resilient, strong and resourceful — what of those other refugees less able to cope? For another take on Walking Free, please see Lisa from ANZ LitLovers review. Thanks for the mention, Kim. Yes, it’s a book that arouses all those emotions you name. I only wish our politicians would read it. Yes, every MP should be made to read this, and anyone who expresses a hateful view of refugees as per most of the media here in the UK. Muderis’ case is a classic example of why people seek refugee status: he came from a privileged family and had to give all that up to flee to Australia; to send him back would only result in his execution. In many cases it is very much a life or death situation. And that’s the case with almost all the people who make it here. The world has stood by and let corrupt regimes which prey on their own people thrive, and then when people try to get away, we turn them back. I don’t know what the solution is, it’s a huge moral issue but people have hardened their hearts.